The United States criminal justice system is broken. As of 2017, African Americans comprise approximately 13% of the population, and yet this demographic also comprises 47% of exonerations for criminal activity (Gross, 2017). According to the National Registry of Exonerations, the state of Tennessee alone has had 26 exonerations since 1989, resulting in over 230 years of served prison time for innocent people. In addition to this, African American individuals are seven times more likely to be convicted of murder than their White counterparts. Despite this knowledge, our criminal justice system continues to prosecute at exorbitant rates, thus fueling the mass incarceration epidemic in our nation today. This brings us to the case of Cyrus Wilson, a man wrongfully accused of murder, who is currently waiting for his exoneration, one that may never come, after serving almost over 25 years in prison. In July 1992, 17-year-old Cyrus Wilson was robbed at gunpoint by Christopher “Cripp” Luckett near the Edgehill Housing Projects in South Nashville. Due to his age, Wilson was unable to press charges for the incident, and as several months passed with no resolution, it seemed as though this incident would be left in the past. Almost two months later, on September 16, 1992, Metro Nashville police were called about a shooting at the Edgehill housing project. When they arrived, officers found the body of Christopher Luckett underneath a chain-link fence. His cause of death was found to be multiple gun shot wounds to the head and torso. Immediately after the murder, officers began interviewing young men who lived in the area in order to find any information on the death of Luckett. During this time, several individuals came forward and suggested the Cyrus Wilson killed Luckett in response to his own attack months prior. Two days after the murder of Luckett, Cyrus Wilson was arrested on circumstantial evidence tying him to Luckett's death. He was held in jail until his trial in February of 1994 when he was charged with first-degree murder and sentenced to life in prison. During his trial, Rodriguez Lee, a key witness for the prosecution, stated that he witnessed the murder and watched as Luckett pled for his life before being shot multiple times by Wilson. Despite this, Wilson maintained his innocence and declared that the witness was lying, as according to Wilson, the events stated by Less had never happened. Despite this, in less than two days, the Jury deemed Wilson guilty and the case was closed for the time being. Throughout his time in prison, Wilson maintained his innocence and created a movement for his exoneration. However, it was many years later that Wilson started to see a glimmer of hope. In 2013, two witnesses from the case came forward to recant their testimonies from the 1992 trial. Rodriguez Lee and Patrick McNally shared that detectives at the time threatened to arrest them for the murder of Luckett if they did not come forward and testify against Wilson. In addition to this, detectives told McNally and Lee to share the facts that they did regarding the incident in question. During this hearing, it also came to light that the weapon supposedly used by Wilson to murder Luckett did not match the shells found at the scene of the crime, thus proving that the weapon in question was not the weapon used in the crime. At this point, it seemed as though the entire case was unraveling and Wilson’s exoneration was imminent. However, in 2014, the Court of Appeals, the Criminal Court of Law, and Prosecutor Hamm denied Wilson’s petition for a re-trial, stating that “only admissions by perjurers and convicted felons about their testimony. Quite frankly, it wouldn’t matter anyway, but there was ample proof to convict the defendant in other ways. There was another eyewitness testimony, and there was circumstantial evidence” (Hale, 2017). Following this, more years passed by, and it once again seemed as though Cyrus Wilson was bound to spend the rest of his days serving time for a crime that he maintained his innocence for. Several years later, in 2017, another witness came forward to recant his testimony. During the 1992 trial, Marquis Harris, who was 14 years old at the time, stated that Wilson had told him his plans to kill Luckett. However, much like Lee and McNally, Harris shared that he had been pressured by the prosecutor at the time and told he would be charged with the murder of Luckett if he did not comply. Despite this, it appears as if there has been no movement in the case since this event. In March of 2019, Cyrus Wilson will be eligible for parole, and it is at this time that we can only hope Cyrus will finally be a free man. The case of Cyrus Wilson is a horrifying example of inequity within the modern criminal justice system. However, we are not powerless in this fight. If the case of Cyrus Wilson resonated with you, join us on February 12, 2019, at 6:30 p.m at the Scruggs Building on the American Baptist College campus for a strategy meeting regarding the parole hearing of Cyrus Wilson. We truly hope to see you there. Hale, Steven. (2017). How the Murder Case Against Cyrus Wilson Has Fallen Apart. Hale, Steven. (2018). Cyrus Wilson is Still Waiting to Find Out If He’ll Get a New Trial. Rahim Buford works with the Children’s Defense Fund Nashville Organizing Team, speaking locally and nationally about his experiences. As founder of the nonprofit Unheard Voices Outreach, he also facilitates classes and workshops at juvenile detention centers, implementing the SALT program (Schools for Alternative Learning and Transformation), which he first experienced as a student when he was in prison. Upon his release in 2015 at the age of 44, after spending 26 years in prison, he was awarded a four-year scholarship to American Baptist College, where he’s currently pursuing a degree in behavioral studies. 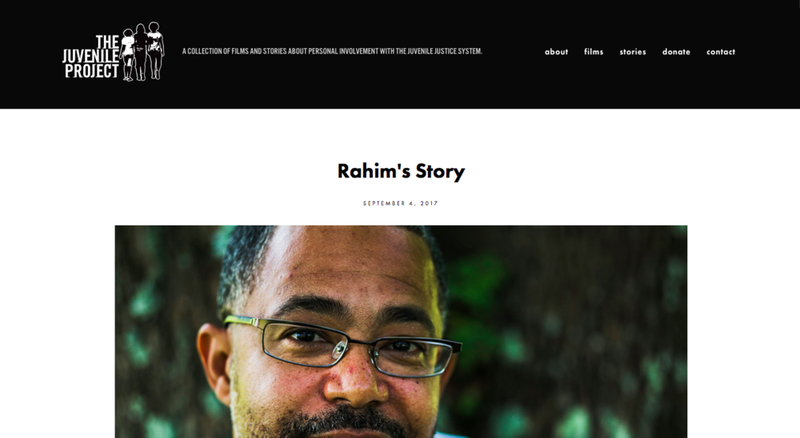 In this interview, Rahim talks about his family and upbringing, his time in the juvenile system, his 26 years in the prison system, what it's been like for him since his release, and his current work in the community. Rahim Buford spoke to us, at 9:00 a.m. Wednesday, from within his 3’ cage in the corner of the conference room. His poetry traced the path that led him to an unprotected place where his do-over childhood met our for-profit prison system. His 26 years in a cage began at age 18. For some of those years, he was cellmates with 3 of his brothers.